When I first became a Christian I was pretty much incapable of saying no. I’d say yes to every volunteer activity, church meeting and group. So much so that I wound up having a commitment 6-7 nights a week! And after a while I realized that being busy with Christian activity was not the same as growing spiritually. I also realized that I didn’t like to say no because I really wanted to please everyone. Fast forward 9 years and I no longer say yes to everything. In fact, I say no to most things. And I don’t feel bad about it. And it’s not just because I’m “too busy.” It’s because in order to focus on what I’m called to do I must say no to a hundred different things in order to focus on the big yeses. So that’s all I got today. An admonition to say no more often. For obvious reasons this message isn’t a popular one at most churches. But most churches focus on Christian activity instead of spiritual growth. Remember that. And remember that you only have one life to live. When it’s all said and done will it matter how many church activities you were involved in or that you took the time to know Him? Sorry this post isn’t more organized… I wrote it on the fly tonight. But hope it speaks to someone out there. I just found your website today as I was searching for information on guarding our hearts. 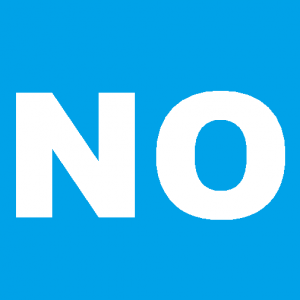 I really appreciate this post on saying no. It is so true! I have been a Christian since I was about 11 years old and my husband and I have mentored college students for about 20 years. We live in Boise Idaho and have been married for 24 years and we have 4 children. Our oldest is going to Boise State University where we help college students learn about Christ and also help them grow in their faith. I/we got caught up in all the “good” activities and had trouble saying no. God finally caught my attention and I started saying no to many activities. It was really hard not feeling guilty. I struggle with some chronic health issues which deplete my energy and this has helped force me to say yes to only what I feel God is calling me/us to do. Although I don’t enjoy having chronic fatigue, I truly believe that God is using it to show me what/who He wants me to focus on. This is definitely not a popular topic and I appreciate your willingness to speak up! I am so happy to hear your story of how God saved you and how He is working in your life! Hi Mari Beth, thank you for the encouragement. And I appreciate what you shared. Saying no is not easy. Especially for those of us who like to be “helpful.” Glad to hear about the journey God has you on. God bless you! Thank you for taking the time to write down your thoughts and the knowledge you have gained through your travel with the Lord Jesus Christ. I started going to a class called Hurts. Habits and Hang-ups about a year ago. I went to encourage my daughter to participate and try to get help for herself. I found myself being the one needing the help. I had become a very troubled co-dependent, fixer of other people and a people pleaser. I was a mess! I have grown and am free from so many of the bad habits that consumed my mind, my sleep, my peace and my relationship with the Holy Spirit. I am so happy! Now I want to thank you for writing down the knowledge God gave you so that it can be sown into the minds of those who are seeking after God. I desperately seek knowledge from others that encourage me in my faith. You have been obedient and I have reaped the rewards of your obedience. I have found that there are times when my mouth cannot relate what I am trying to say, but I can ask the spirit to come and he helps me write what he want me to saw. He enlightens my fingers to write what he wants me and others to know. He is so good. I am learning to share this knowledge with the ones in my class. There are times when I read what was given to me and it opens up the minds of the one who are seeking to know what he has for them. Again, thank you for being obedient to our Lord and Savior Jesus Christ. He is our all and all. He is to be first in everything we do. PS: Satan did not want me to write this. He has tried to stop me, but God told me to send you this message so that you may be encouraged to know that he is the one who knows your heart and that your words (written down for those who seek his knowledge) are of a great witness to your faith. I am thankful for your witness of the goodness of God in your life. Thank you for sharing. And I apologize about the super-late reply! Your comment wound up at the bottom on a bunch of unapproved spam comments I got and I just got around to clearing those out. Anyway, I really appreciate your encouraging words and for sharing your story too. I do believe that as we honestly share our experience, strength and hope with others we can help change lives. God bless you and your family!